 Ignatieff, well-known in British TV as the smooth host of cerebral talk shows and political documentaries, takes on what he calls the rising tide of ``ethnic nationalism.'' There are two kinds of contemporary nationalism, says Ignatieff, ``civic'' and ``ethnic,'' the first based on a common perception of shared law, and the second--derived from the German romantics--based on blood kinship. With its susceptibility to race hatred, the second appears to be exploding in a world no longer stabilized by an imperial order that once held local nationalists in check. That fact given, the present book's strength is that it follows a highly personal itinerary through places the author himself has either lived in or has a vested personal interest in. 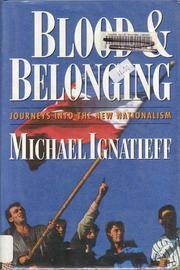 This gives the chapters on Yugoslavia (where Ignatieff stayed for two years as a child), Ukraine (he is the descendant of Ukrainian emigrants), and Quebec (he is a Canadian citizen) a poignancy that those dealing with Germany, Kurdistan, and Northern Ireland lack. There are delicious moments in these chapters. Revisiting the Highway of Brotherhood and Unity in Croatia, Ignatieff finds all the highway signs painted over; peeling back the decal that reads ``Lipovac'' (a Croatian town), he sees the sign for Serbian Zagreb beneath it. He is witty on the subject of Communist soap and the little men with briefcases who represent the bold new face of entrepreneurial capitalism in Ukraine. And the interviews with individuals are nicely drawn: Mikola Horbal, the hero of the Ukrainian independence movement; Tito's fellow-revolutionary, Djilas; and sundry folk on the ground. The book's weaknesses, though, derive from the same qualities. The anecdotal touch leads to off-hand meditations and a glib self-importance. ``If anyone has a claim to being a cosmopolitan, it is me.'' Travels through a newly emerging old world, then, with a suave character.